I’ve been ticking off a few bucket list items recently. 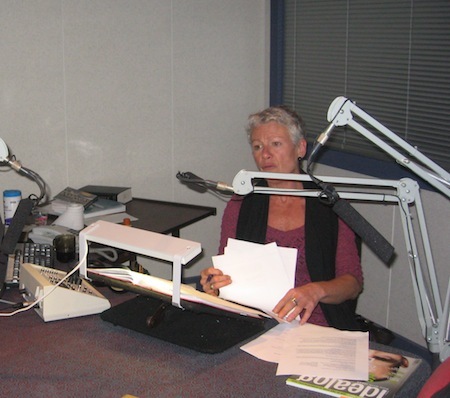 Including last weekend, when I had the opportunity to be on the Saturday Morning National Radio show hosted by Kim Hill, to coincide with the launch of Trade Me: The Inside Story. It was terrifying at the time, but fun in hindsight. As I mentioned on air, the podcast version of the show (now online) is unfortunately a little disjointed because they are unable to include the audio tracks for copyright reasons. It’s actually a shame that they can’t include the things we talked about off air while the songs were playing instead – in many ways that was the most interesting part of the interview. I always enjoy watching people who are experts do their job, and so this was a great opportunity to watch a master journalist and interviewer up close. It was fascinating to see how well prepared she was – especially given the wide range of topics covered on the show that morning. And, to watch her constantly thinking several steps ahead. As I sat down the first thing she said to me was “So are you fabulously rich because of Trade Me?” I instinctively said “It depends what you mean by ‘fabulous’ I guess”. As I watched her scribble on her notes I realised that I’d already answered the first question, and we were still a few minutes away from going on air. She was very charming and I managed to get through without saying anything too embarrassing. Although, the conversation I had earlier with Mark Cubey, her producer, about verbal crutches did make me doubly conscious of all of the filler words I use – you’ll notice that “ummm”, “I guess” and “sort of” feature heavily though out, as well as a couple of “hmmm”s as I quickly try and think of a sound bite answer to a difficult question. Either way, take a listen and let me know what you think. Hear if you can spot the obscure periodic table of the elements reference when we’re talking about athletic challenges.